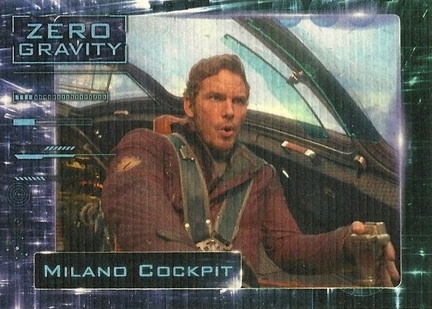 2014 Upper Deck Guardians of the Galaxy features a lineup of heroes that don't have the same level of notoriety as other Marvel heroes like Iron Man, Captain America and the rest of the Avengers. On the flipside, it's a new potential franchise that doesn't come with nearly the same amount of hype. Every hobby box comes with three hits including a pair of memorabilia cards. The base set has a total of 90 cards, all of which feature foil. With just ten packs per hobby box, it's going to take more than one to finish it. Hobby boxes also ave a pair of parallels, Bronze and Purple (#/25). These combine to fall one per pack. Other parallels include Light Blue and Pink. 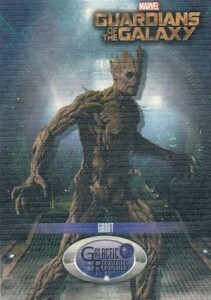 2014 Upper Deck Guardians of the Galaxy has a deep roster of inserts and special cards. Movie Posters come with promotional artwork from around the world. 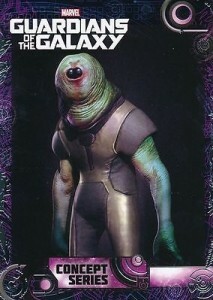 Others include concept art, character cards and detailed looks at aliens and Sci-fi tech. 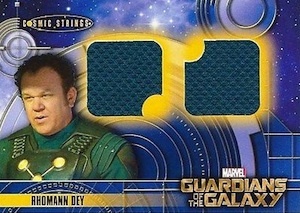 Hobby boxes have a pair of Cosmic Strings memorabilia cards, one of which is a multi-memorabilia card. They come in a variety of styles like basic swatches, over-sized piecees and autographed memorabilia. The toughest versions are Autographed Cosmic Strings (1:480 packs), Cosmic Strings Team (1:2,400 packs) and Cosmic Strings Max (1:2,400 packs). Hobby boxes also have a third hit, which is either an autograph or sketch card. 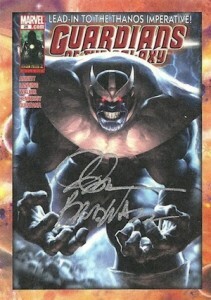 Autographs are a mix of actors and comic artists, which are signed on-card. Single autographs are inserted 1:80 packs while dual autographs are 1:480 packs. Classic Covers Autographs fall 1:60 packs. 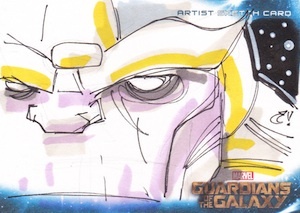 Sketch cards have several variations: Character (1:40 packs), Vertical (1:40 packs), Horizontal (1:80 packs) and POI (1:240 packs). The final card in every hobby box is an over-sized card. Every twelfth bonus pack has an over-sized sketch card. Retail packs come with exclusive Punch Out Ship Builder cards. 8 cards. Click here for more details and images. 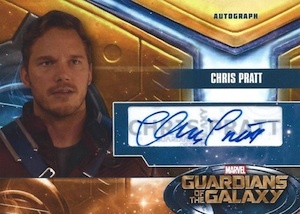 Good: Stellar autographs, fun parallels, attractive box toppers. 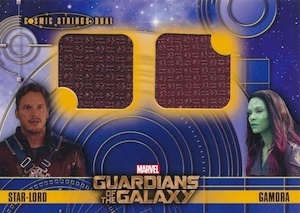 Bad: Just ten packs per box, textured card stock for inserts is nice but overdone. 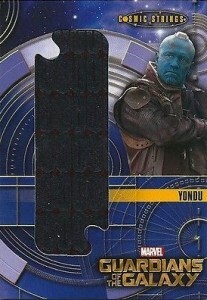 The Bottom Line: Upper Deck has pretty much nailed down a reliable format for Marvel movie cards. 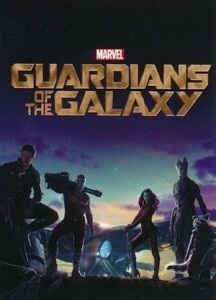 Offering a nice mix of premium content and stuff that’s just plain cool, Guardians of the Galaxy is a great compliment to the movie. And while the hobby version might be a little too pricey for those who want to focus on the base cards and low-end elements, there’s a more affordable retail version that delivers in that regard. 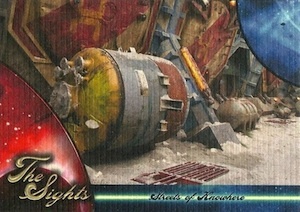 Base cards are very colorful, pulling in both the sci-fi elements and the fun with the cassette foil pattern running along the side. Some of the images are a little repetitive as they seem to come from pretty much the same moment, but it’s not horrendous. 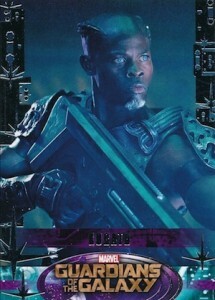 I really like how the parallels add the foil cassette outline in the background. It’s definitely a cooler effect than simply adding a different color foil to the border. All basic inserts are done on a canvas-type card stock. While I like the look, the different sets bleed together. It’d be nice to see more differentiation here. Memorabilia cards look good both design-wise and material type. Upper Deck was given some nice textured pieces to work with. 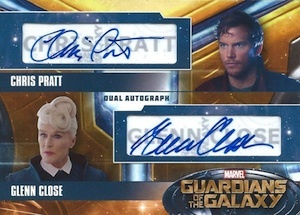 The use of the same character shot on these over and over, along with the autographs, is something of a downer but that’s likely only going to impact those chasing all the cards of someone or the set. While I’d love to see the Actor Autographs not use stickers, I’d rather see the strong checklist. 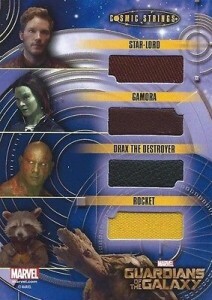 Out of all Upper Deck’s Marvel movie sets, this might have the deepest checklist yet. 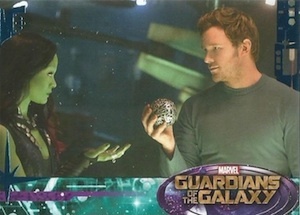 The base set is solid, capturing images from a good chunk of the movie. With retail arriving before the movie’s release, it’s missing a lot but key characters are covered. With hobby boxes delivering so few packs and base cards, the number of short prints is overkill. Had they been cut in half, it would have been more understandable and manageable. That said, I like the subset approach the short prints take. It means that those who chase them get a deeper look at the movie and its production and those who want just the main base can still have the sense of something that’s complete. 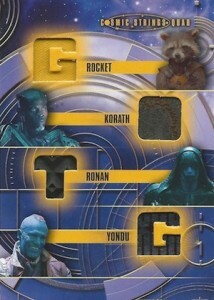 Guardians of the Galaxy has one of the greatest autograph checklists ever released for a movie set. 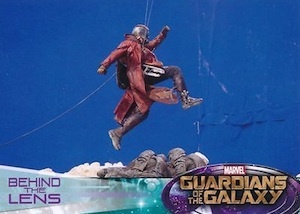 The movie has a deep cast to begin with yet Upper Deck was able to land signatures from all the main characters except for Bradley Cooper (Rocket) and Vin Diesel (Groot). While they’re tough to pull, I’d rather chase a set that takes this less-is-more approach as every autograph has meaning. I think the hobby has veered a little to far into the promised hits territory. That means a lot of sets have weaker checklists in order to hit those targets. 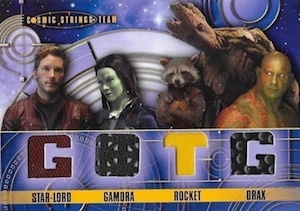 The base inserts do a nice job of adding to the set’s overall depth and the costume cards add that promised hit factor (although why Rocket is part of the memorabilia list is beyond me, even when specific pieces of memorabilia might not be joined to a specific character). 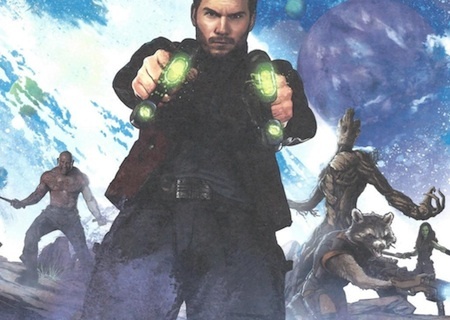 Despite having just ten packs in a box, Guardians of the Galaxy delivers. I didn’t land an autograph, but it still felt like a fairly solid box. 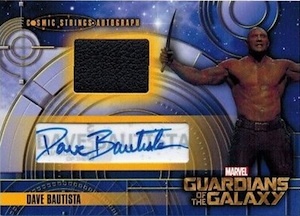 It certainly wouldn’t have recouped its cost as an individual box, but those that hit an autograph, memorabilia short print or premium sketch card can see massive returns. Upper Deck continues to excel at offering bonus content above and beyond what’s promised. 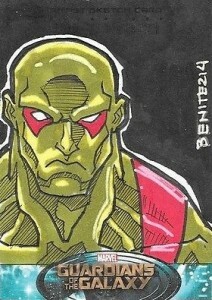 Here’s it’s the randomly inserted jumbo sketch card that are in the box topper packs. The box toppers are cool on their own, even when you don’t land a sketch. For those wanting to focus on the base set, look for retail. It delivers a lot more cards but because there aren’t any premium inserts, the cost is lower. It’s actually nice that Upper Deck is able to cater to both types of collectors this way. 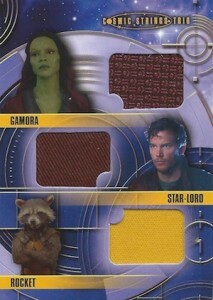 Upper Deck has done some great sets for the Marvel movies over the last few years. However, I think this is my favorite one yet. It’s focused, has some killer content and doesn’t go overboard. 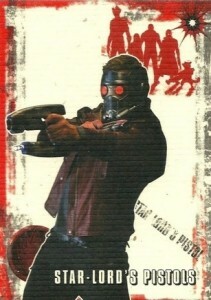 The fact that Guardians of the Galaxy is such a fun movie helps the cards out quite a bit too. Love your site! Are there no details on SP’s etc.? I pulled a Stan Lee retro cover auto and am trying to find out how rare it is! Any help is appreciated.